Sept13 I worked with a small group from The North of England Art Club on a commission for a 24m run of ceiling panels to be hung in a new Wetherspoon's pub in Byker. The change of scale has been a new challenge for all of us except Ken, who used to work on large scale graphics for Formica. We worked in a temporary 'studio' based in a listed Georgian house (awaiting further restoration) in Westgate Road. 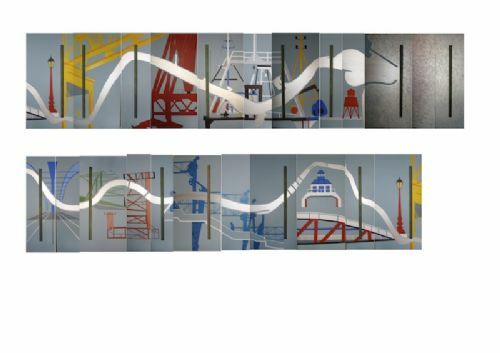 The design theme is The River Tyne and shows abstracted images of riverside structures (masts, cranes,bridges,staithes) from Tynemouth to Blaydon.